It's post season time. Be honest with me, you can't say the word "playoffs" in your head without saying "PLAYOFFS!" (Jim Mora style). Be honest. h/t J.R Ewing (a.k.a. Bevo XIV a.k.a. DW) in comments below. Speaking of J.R. Ewing, which reminds me of Dallas, which reminds me of wannabe Los Angeles, which reminds me of that West Coast "sound," DJ Quik did as much to mold West Coast hip-hop as Dr. Dre. Thought you should know. And, while not an old school DJ Quik song, this new school one has an NFL vibe. Left click to enlarge, then right click, "View Image"
Screw Houston or New Orleans, it is the year of the Tebow, until further notice. If I refer to you as KSc, SS, or GN, then you probably wish you had joined the quarter plus percent of the league that failed to make a pick in the first round of the NFL playoffs. Despite losing our Pick'em mortgage, this weekend provided some compelling football games (ignoring that egg that the dirty birds laid on offense). Three of you guys picked 100% against the spread (CCa, CG, ANe). Of the three, only SEC Rejects (ANe) embraced a bet-big/win-big strategy and went all in for Week 1. The Pick'em house takes no juice, so ANe doubled his money and leads the league going into Week 2. DD and KH also did quite well at the Pick'em Casino this weekend. I don't know if I even like Denver or Tebow, but I'm fascinated by the story. I'm curious, how many points would someone have to give you before you put REAL money on Denver vs New England? Two scores at least, right? Before you guys get all fundamentalist on me, Jesus clearly doesn't pull for Roethlisberger. You could have taken that on the moneyline. But what about Brady? He didn't get all those gifts he has with just hard work. Uh, obviously he was gifted most of it. Should be interesting this weekend. Just saying. ...As should every game in Week 2 of the NFL Playoffs. Saints. Texans. Defending Champs vs baby Manning. The Jesuses. Unless you are an atheist Cowboys fan, you are going to have a Pitbull-ish Dr Pepper-like real good time. The NFL Playoff Week 2 - Divisional Playoffs card will get sent around Wednesday morning. 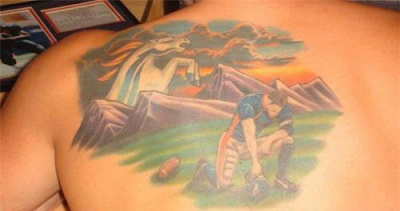 Loser has to get a worse tattoo than this one. Seriously? No more who dat? No more Chosen One*? No more Jacoby punt returns? No more discount double check? I TOLD YOU NOT TO DO THE SPARKLES!!!!! I knew I should have worn my VY Texans jersey. *Brady may actually be the more divinely gifted one. BREAKING: According to CBS Sports, Patriots to stick with Drew Bledsoe. Houston off to a good start, Saints not so much. Need a cover here! With this group dynamic, I was surprised not to see more "all in's" on the Saints. Only 1. Maybe last year's loss made people shy. Ditka: "Why do you care"
KH (whoever that babbling idiot is) put a lot of balls on the Texans, credit to him! KH has balls... (literally) in his pants. That Saints-Lions game was so exciting. Thank goodness I DVR'ed...it was like watching an action movie! I should have put more points on the Saints. Not sure what my chances of winning are now. I'm confused should I have used all my points available to me this week ( I thought I did). What's the strategy here? @Chumlee's: It is up to you. Not everyone uses all their points. It is your "money" to spend. Whoever has the most at the end (after Super Bowl) wins. Ok...I am putting a lot of my "money" on the Patriots next week....Tebow mania is going out of control!!!!!!!!!!!!!!!!! Greg where is the play card for today's games?